I spent the long weekend at my uncle’s cottage in Quebec, meaning the last three days have been filled with sun, beer, and poutine. It was already destined to be a low-productivity day, but the final nail in the coffin was the announcement of Google Chrome. There’s already been lots of talk (and speculation) about the performance aspects of Chrome, and about Google’s strategic motives in releasing it. But of course, I’m more interested in the user experience. I’ve been running Chrome for over three hours now, and here are my first impressions of it from a user experience and usability angle. The Google Chrome web site lists the key features here; I’ll address those on a point-by-point basis. 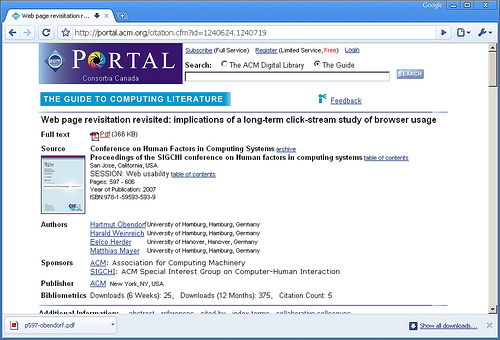 There’s evidence that many people don’t know the difference between the search box and the URL bar (see here). Chrome avoids this problem by getting rid of the separate search bar altogether: URLs and keyword searches are typed into the same text box. They call this box the omnibox, and it works a lot like Firefox 3’s awesomebar. This is a small feature, but a nice one. I’ve never understood why it was necessary to have a separate search bar and URL bar in Firefox, especially since you can type keywords into the URL bar and it will do a search for those terms. And now that I’m used to the awesomebar, I find myself typing search keywords into the URL bar all the time. In Firefox and Safari, when you open a new tab, you’re greeted with a blank page. As Aza Raskin recently observed: “while clean, it has a 100% probability of not getting you where what you want to be.” In Chrome, when you open up a new tab, it’s filled with a bunch of handy navigation shortcuts. Again, a small but nice touch. It’s actually remarkably similar to some of the ideas that Aza has been throwing around for future versions of Firefox; check out his post here. Another idea that’s been floating around in various forms for a while now: Chrome lets you create an “application shortcut” from any site that you visit. Basically, it’s a quick and easy way to create site-specific browsers for your favourite web applications. It puts a shortcut on your desktop to launch the site in a separate window, with none of the usual web browser controls. You can get similar functionality in Firefox by installing the Prism extension. Personally, this is a feature I could take or leave. I’m not yet convinced that site-specific browsers are the way to go. I gave Prism a quick try with my GMail, and I found that I missed having the regular browser features at my fingertips. This is a feature I love: you can drag tabs out of their window to create a new window, and drag tabs between windows. I know Safari has supports this to some extent (don’t have my Mac handy to check) but I can guarantee it’s not as snappy as it is in Chrome. Unless you spend a lot of time…er, buying birthday gifts for your spouse, this is not a big deal. Basically the same as Safari’s “private browsing” feature. Again, nothing too exciting here — Firefox 3 has very similar features, which probably greatly influenced Chrome. What I really like here is that I can interact with the PDF icon just like I can on my desktop: I can double-click it to open it, or drag-and-drop it to copy it to a new location. And another cool feature which they don’t advertise is that you can drag-and-drop files from Windows Explorer onto File Chooser controls — another feature I’ve been craving for a while. Having a process per tab also means that a single buggy site can’t bring down your entire browser. Apparently plugins also run in a separate process, so no more worrying about crappy plugins crashing your browser (Acrobat, I’m looking at you). In my opinion, the performance and stability gains are big usability wins. Overall, I’m really impressed with the attention to the user experience in Google Chrome. Google doesn’t have a reputation for great UI design, with a few exceptions (GMail, Maps), but I think they’ve hit a winner with Chrome. There are no groundbreaking new features, but a bunch of small, solid improvements that make for an overall great user experience. The biggest thing most people will notice is that almost everything in Chrome is extremely snappy. This might not seem like a big deal, but it really makes the browser a pleasure to use. Ceiling cat is watching you . . .
Chrome has a chance of being a sure winner in the browser market. They seem torn on defeating Firefox though. Apparently, Chrome only competes for the "alternative" browser market or those geeks that are willing to stray away from the default browser (only 30%). That means Chrome is competing directly with Firefox. But Chrome was needed to deliver their web applications, gmail, analytics and such which are much faster and hassle free in regards to compatibility. It's been nearly 2 months, are you still using Chrome daily?